*Sorry, gift wrapping not available for Puzzle Expert™ Tabletop Easel or Tilt-Up Table. Never stretch for hard-to-reach puzzle pieces again. Pop out the reinforced support legs for a free standing table or place flat on a table of your own. Our exclusive custom designed tilt-up table features a generous 25" x 34" work surface to accommodate standard 1500 piece puzzles, or work on your favourite hobby. Raise the specially treated non-slip felt covered working surface, with the wooden easel on the back and have a comfortable experience assembling your puzzles. 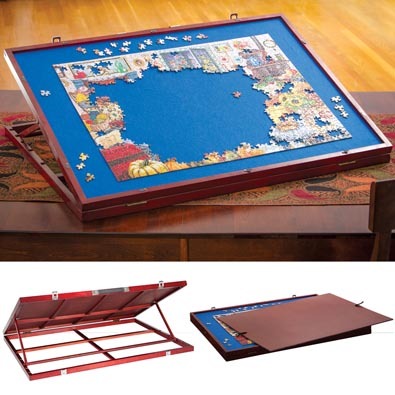 A masonite cover is supplied to secure your puzzle in progress with swivel clips to secure it in place. Quickly folds down to a compact 35-1/4" x 26-1/4" x 3-1/2" and secures with a metal pin, to store flat under a sofa or in a closet. Made of New Zealand pine. Instructions included.